Preheat oven to 350 degrees F. Grease a 9×5 loaf pan and set aside. In a small bowl, whisk together flour, baking soda, powder, nutmeg and salt until combined. Set aside. In a large bowl, whisk cooled butter with sugar until smooth. Add in vanilla extract, mixing until combined, then whisk in each egg one at a time until totally combined. Add half of the flour mixture, stirring with a large spoon, then stir in the eggnog until smooth. Add remaining dry ingredients and stir until just combined and smooth. Fold in chocolate chips. Pour in the greased loaf pan. Bake for 50-55 minutes, until top is golden and cake is just set. Let cool completely, then cover in glaze. To make glaze, whisk together brownie butter, sugar and eggnog, stirring well for 1-2 full minutes until combined. 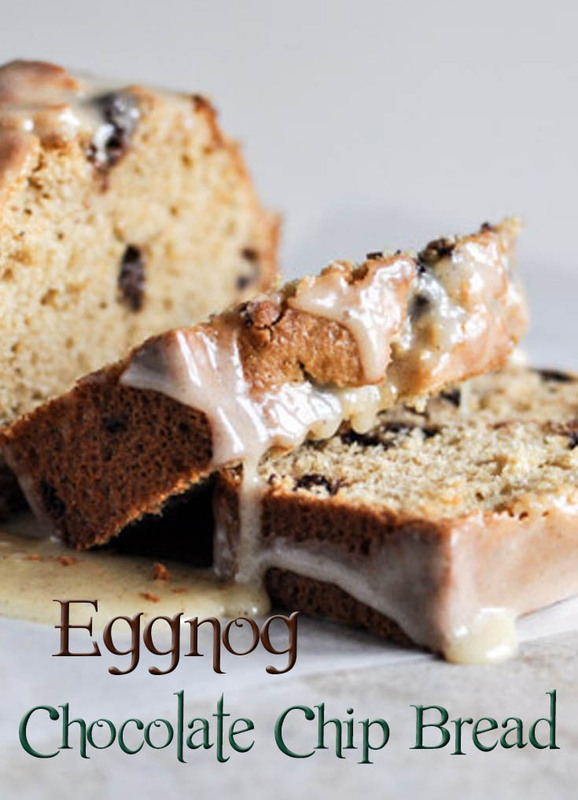 If it still doesn’t appear glaze-like, add in eggnog 1/2 tablespoon at a time and mix again. Don’t worry if it becomes too liquidy – just add a tiny bit of powdered sugar until you get the desired consistency. Spoon glaze on bread then serve.